This was a (Class 3 | Cat 1) residential water loss. The source of the water loss was a failed supply line associated with the toilet. Considerable amounts of water ran under the 9″ x 9″ vinyl tiles and a fair portion of the tiles popped up as they no longer maintained adequate adhesion to the slab. This triggered the need for abatement of the ACM tiles. The Southern California property was built in 1972 and subsequently required testing prior to demolition of the affected building materials. The initial asbestos bulk sample PLM (Polarized Light Microscopy) survey came back “hot” for chrysotile (serpentine) asbestos well in excess of 1% (AKA Trace). In an effort to validate the findings of the PLM findings, the lab followed it up with a Point Count analysis that subsequently confirmed the initial PLM findings. 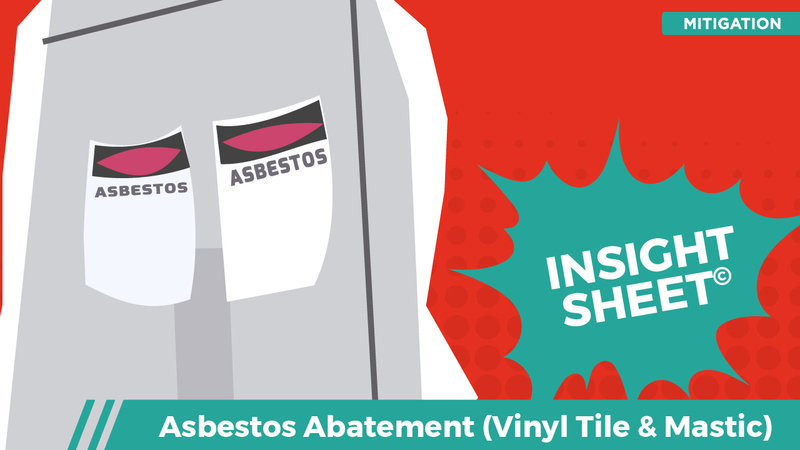 This Insight Sheet exists to clarify how one might invoice for removing vinyl tile and mastic as a part of asbestos abatement. This does not seek to include or make concessions for all equipment and/or activities as it relates to a loss of this nature. PPEs, PCM/TEM cassettes, and environmental surveys (including testing for other contaminants (e.g., lead)) reside beyond the scope of this Insight Sheet©. Note: The laws and regulations associated with asbestos surveys and abatement vary wildly depending on the given region. The governing regulatory bodies have established and enforced laws that are not all perfectly in accord with one another. In fact, they are often in conflict with one another. As such, each region has developed their own “sacred cows” as it relates to care, custody, and control in an abatement environment. 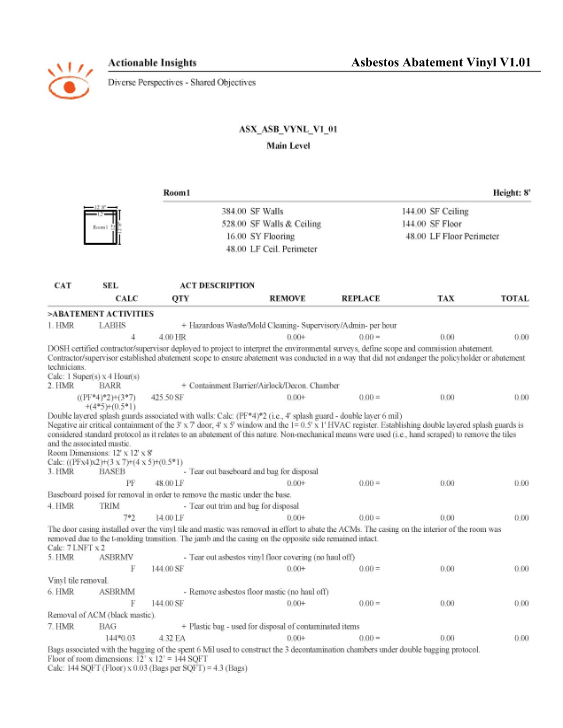 The AIF Board created this Insight Sheet with an eye toward championing established standards as it relates to invoicing for an asbestos abatement project. The Board did not seek to explore the regulatory aspect of a loss of this nature at length. If ever a materially interested parties remain unsure as to how best to proceed, it may be advisable to engage an IH (Industrial Hygienist) and have the IH write up a scope/protocol.